Dachshunds (also called Dachsies) are very loyal and loving dog breeds. They are one of the most popular breeds in America and have been the stars of numerous films. One such film was “Toy Story”. After this film came out the popularity of the breed rose. I am sure that many children wanted one because of the film. I can never stress enough that buying a pet because it was in a film or book is not the best way to go. Dog Adoption is a very important commitment and it is best to find the right dog breed for you. Who Should Adopt a Pet Dachshund? Dachshies are one of the Most Popular Dog Breeds so they are worth consideration. But they are not for everyone. The Dachshie dog breed is not the easiest breed to train. They are stubborn and love to get their own way. They can be selfish and will sometimes worry more about their comfort than pleasing you. So training will take some time. If you are patient and firm then this breed could be right for you. They love being comfortable and will not object to curling up with you on your bed or couch. In fact they love being warm and snug. So if you are looking for a dog that will keep you company while watching television you might just have found the right breed for you. If you are not home a lot then a Dachshie might not be right for you. They do not like to be left alone and will show separation anxiety if left too long. If you have to be out for long periods of time it is a good idea to get someone to check in your dachshund. Dachshunds are not the best breed of dog for children. They do not tolerate being teased or rough housed with as well as some other breeds. If the children are older and understand the need to be very kind to the dog then it would be fine. If you have smaller animals like a cat or rodents this breed of dog might hunt them out of instinct. They were bred to hunt badgers originally and have a hunting instinct that might be stronger than their instinct to please you. They love chasing and hunting small animals. If you want a dog that will give your home a sense of security this breed might be right for you. Dachshies are territorial and have a loud bark when they see a stranger. Aside from their temperament being a bit stubborn and needing company, the biggest concern with this breed is the make up of their body. They are prone to back problems – especially if they get overweight. So be sure to commit to proper feeding and regular exercise. There are two types of dachshie – a full grown one and a miniature. 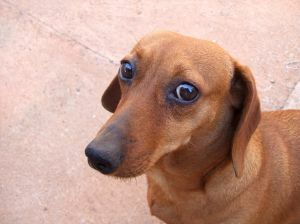 A full-grown standard dachshund weighs 16-28 pounds (7-13kg), and the miniature normally weighs less than 11 lb (5.0 kg). The miniature was bred to hunt smaller game, especially rabbits since a miniature could get down into the burrowsDachsunds have three types of coat: smooth coats, long haired coats and wire-hair. They have a wide variety of colors and patterns. They can be single colored, single colored with spots (or dappled) and single colored with tan points plus any pattern. The dominant color is red. It is the most common along with black and tan. Should You Adopt a Dachsund Dog Breed? You need to decide this for yourself. It is important that you consider a variety of dogs and give some real thought to your lifestyle to find the right breed for you.